Looking for a ring to last a lifetime? Our 8mm men’s titanium ring with Hawaiian mango wood center inlay features an innovative design, handcrafted details, and gleaming edges to provide a two-toned finishing touch to any outfit. Titanium is one of the most popular alternative metals on the market. Titanium is perfect for any man who leads an active lifestyle or works in a demanding job. Similar to tungsten, titanium offers a silvery luster and extreme strength. Best of all, mango wood is sustainable and provides a dense grain pattern that will stand up to the wear and tear of your daily grind. 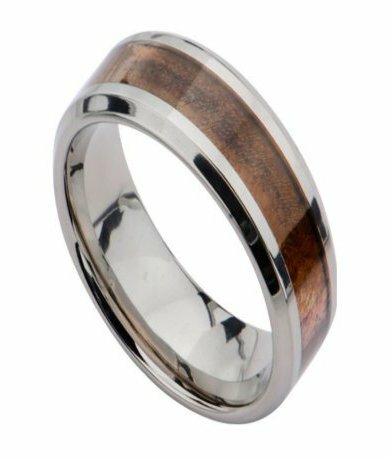 Each 8mm men’s titanium ring with Hawaiian mango wood center inlay is one-of-a-kind with natural wood variations and will make any groom smile on the big day. Commemorate the symbolism of your growing family by choosing our men’s titanium ring with Hawaiian mango wood center inlay as your wedding band. This designer ring is instantly unforgettable and ties in your love of nature with your individual sense of style. The comfort fit interior is crafted using a little extra metal, so these types of rings usually measure a half size smaller than traditional fittings. We recommend that you have your ring finger sized by a professional jeweler to determine whether a comfort fit ring like our 8mm men’s titanium ring with Hawaiian mango wood center inlay is right for you and your lifestyle. Please feel free to contact JustMensRings.com today with any questions or concerns, and a member of our team will help you every step of the way to finding your forever ring.